Now this is a match made in heaven! The delicate bitterness of the chocolate with the savoury yet sweetness of the bacon makes for a unique truffle. These truffles are great if you use a 70% cocoa dark chocolate so try and use the best chocolate you can find to make an indulgent treat. Of course (if there are any left!) you can dress the truffles up and give as gifts. You could also add a shot of rum or bourbon to pep the truffles up! 1. Preheat the oven to 220c/ 180 fan. Lay out the slices of streaky bacon and rub 1/2tsp of the sugar onto each slice. I then transfer them to a wire rack placed on a baking tray so any drips of fat can be caught as the bacon cooks, making it easier to clean. 2. Cook the bacon for 10 minutes on each side before removing from the oven and allowing to cool. The sugar on the bacon will caramelise in the oven and the bacon will harden as it cools. Try to resist the temptation to have a nibble! When the bacon is cool finely chop the bacon and set aside. 3. Over a medium heat, add the double cream to a saucepan and heat until it just begins to simmer. Take it off the heat and then stir through the chopped chocolate until combined well. 4. Add the cooled bacon pieces to the chocolate mixture. I then transfer the mixture to a bowl to pop into the fridge to chill for at least 2 hours or overnight if you can. 5. When the chocolate is chilled and hardened enough to handle, start rolling the truffles. You can either use a melon baller or scoop the chocolate with a teaspoon before shaping. 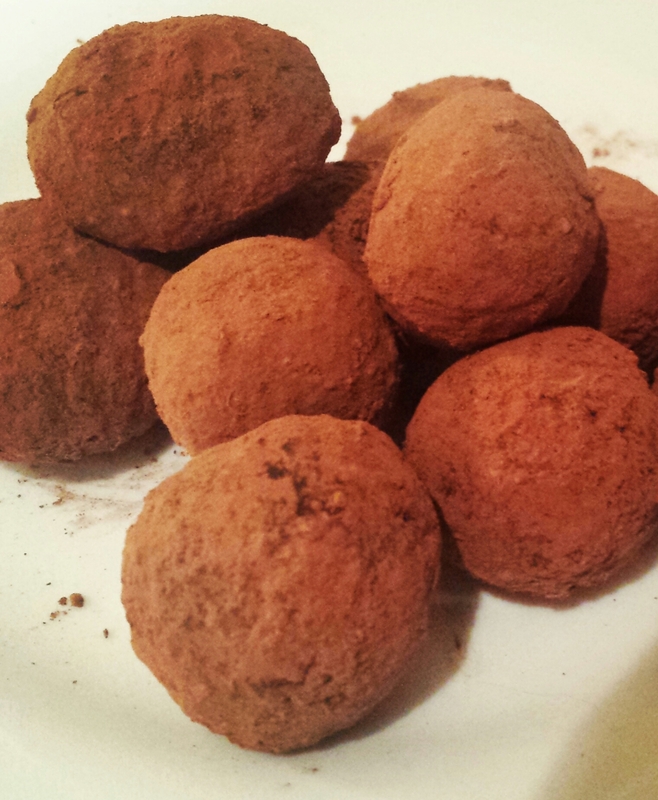 When you have rolled the truffles, coat them in the cocoa powder to finish. You could also try a nutty coating such as finely chopped hazelnuts if you like. Keep the truffles in the fridge until ready to devour! There we have it! Indulgent dark chocolate and bacon truffles to test the taste buds of all your friends!